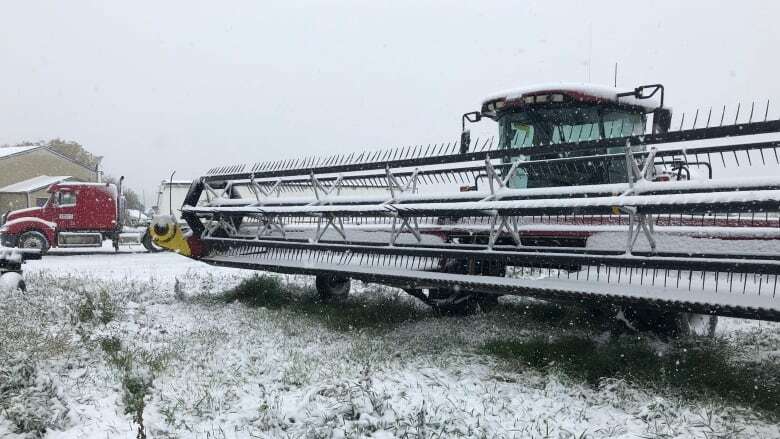 Snow has blanketed northwest Saskatchewan, stopping harvest before it could get going. You can hear the frustration in Devon Walker's voice. He wants to be in the field harvesting his crop. The problem is it's under more than inch of snow. "It's pretty stressful," Walker said from his farm near Lashburn, Sask., about 225 kilometres northwest of Saskatoon. While producers in southern Saskatchewan have, on average, more than 80 per cent of their crop in the bin, the northwest is another story entirely. According to the most recent crop report from the Ministry of Agriculture, only 17 per cent of the crop the northwest region has been combined. But Walker has only combined five per cent of his crop. He grows yellow peas, faba beans, wheat and canola. 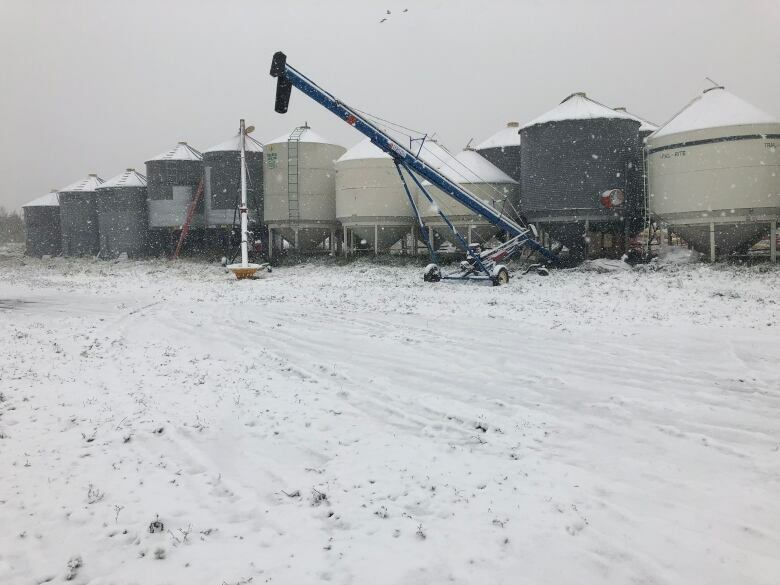 He estimated that based on his average yields on his 2,200-acre farm, about $800,000 worth of crop is under the snow now. "We have stacks of bills like everybody else does at this time of year and all the money to pay for it is under what looks to be an inch and a half, two inches of snow." Walker said the last three years have been "troublesome harvests." "Since the middle of August we've had about nine days of sunlight, between smoke, cloud cover, rain and now snow. We're sitting and waiting." He said even if the conditions change, he will need to spend time and money drying whatever crop he can take off. "The days are getting shorter so there's less of a chance for drying and the reality of possibly not finishing harvest [is] starting to set in," Walker said. "Things could be worse. As farmers we are chronic optimists." Daryl Fransoo farms about 90 kilometres east of Walker in Glaslyn, and he has even less combined. "We haven't harvested a bushel yet. We're way behind normal. Usually by the end of September we're done." Fransoo has canola, wheat, peas and barley on about 5,000 acres. He said wet conditions and snow have prevented the crop from maturing and drying out so it can be combined. "It can be a tough time. We know mental health is a big issue in farming and agriculture so be kind to people and listen to people. It's a stressful time when you have millions of dollars sitting out in the field," Fransoo said. According to the Ministry of Agriculture's weekly crop report, 62 per cent of crop is in the bin, which is ahead of the five-year average of 53 per cent.